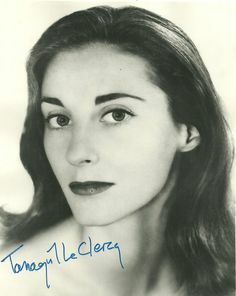 Tanaquil Le Clercq is a legend. Not in the modern sense of "legend" but in that old-world, truly remarkable, lager than life, sadder than death, extraordinarily gorgeous, muse to many kind of legend. First, and foremost, she was a dancer. An extraordinary, ethereal dancer. At the age of 12, she was offered a scholarship to the School of American Ballet by George Balanchine. At 17, she would help launch the Ballet Society that would later become the New York City Ballet. At 23, she would become Balachine's fourth or fifth wife, depending on who's counting. When Le Clercq was 15, Balanchine asked her to be his partner in a dance he created entitled "Resurgence" for a March of Dimes charity benefit. He would play the role of Polio and she would be his tragic victim, paralyzed by the dreaded affliction. The dance might hardly be remembered if not for its prophetic nature. In 1956, at the height of career, Tanaquil Le Clercq contracted polio and was paralysed. She was 27- years-old. Jerome Robbins choreographed one his most famous ballet's for Le Clercq. Afternoon of a Faun, taken from a Debussy prelude, is still being preformed. In 2013, Nancy Buirski completed a documentary Afternoon of a Faun: Tanaquil Le Clercq. 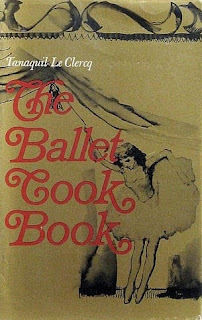 It is one of the best sources for footage of Le Clercq dancing. After her paralysis, she became an author penning the autobiography of Mourka, a cat Balanchine taught to "dance." In 1966 she compiled The Ballet Cook Book featuring stories and recipes featuring a who's who of the world of ballet from Sir Frederick Ashton to Vera Zorina. It has become one of the most collectible cookbooks on the market. Always a holiday treat, here is Le Clercq's family recipe for eggnog. Beat egg yolks and sugar until light and sugar has melted completely. Add whisky and rum and continue beating 3–4 minutes. Stir in the whipped cream and mix thoroughly. Place in refrigerator and chill until ready to serve. Even the poet, Frank O'Hara found Le Clercq to be a muse. 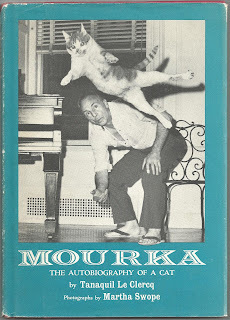 Cats, cookbooks, ballet, poetry -- who could go wrong. 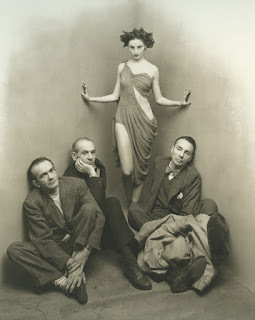 If you are fond of ballet, do check out Afternoon of a Faun: Tanaquil Le Clercq. PBS ran it several years ago and I think it might still be out there to download. I suggest making a big bowl of eggnog and gathering for a screening. Lovely Lucinda. You are amazing as usual. I rarely come here and do not learn something. And yes, cats, cookbooks, ballet and poetry make for a happy life! I never have liked brown licquor but I do love eggnog oddly enough -it must be the cream! I'll have to try this variation.